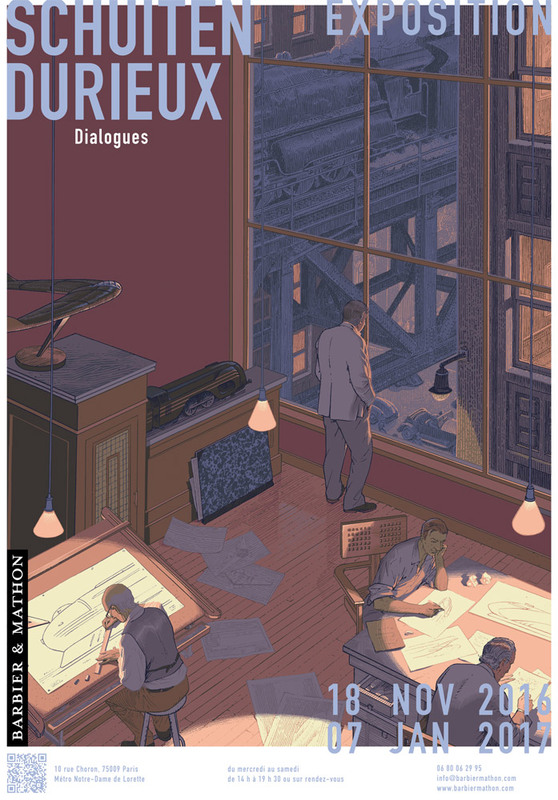 Dialogues is an exhibition of work by François Schuiten and Laurent Durieux at Gallery Barbier Mathon in Paris. The exhibition will be held from November 18, 2016 until January 7, 2017. The artwork of the announcement poster was turned into a serigraphy called Dialogues by Atlantic 12. Gallery Barbier Mathon published also a catalogue of the exhibition. photos by Bud Barbier, Yann Le Tarnec and Froilan Domico Betancor. François Schuiten and Laurent Durieux with James Huth,director of Brice de Nice & lucky Luke (photo by Bud Barbier 1)). On November 17, 2016 the exhibition was opened. Many people turned up, so you can see André Juillard, Enki Bilal, Laurent Durieux and François Schuiten in one picture.